Ched Evans scored twice as Fleetwood climbed to eighth in the League One table with a 3-0 win away to bottom side AFC Wimbledon. Evans scored after 18 minutes and added the second from close range on the half hour to put the visitors in charge. Substitute Ashley Hunter headed in a third with seven minutes left to wrap up the three points for his side. The deadlock was broken in the 19th minute when a rasping drive from Ross Wallace cannoned off the left-hand post and Evans had the easiest of tap-ins. The former Sheffield United striker doubled his account on the half hour when a bright run from Wes Burns was followed by a cross to Paddy Madden, whose low shot was parried by Dons stopper Aaron Ramsdale into the path of Evans for a carbon copy finish. 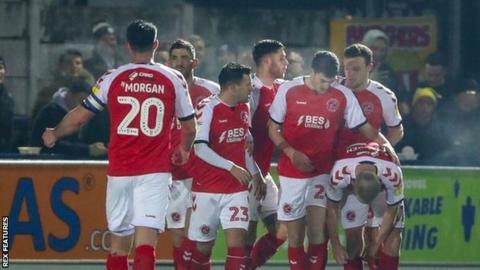 Joey Barton's men were rarely troubled after the break and Fleetwood secured the win when Evans' close-range effort was palmed into the air and Hunter sharply followed up. The 40 travelling fans were well rewarded for making the long journey from Lancashire, while Wally Downes' men are now staring relegation in the face with more than three months of the season to go. Match ends, AFC Wimbledon 0, Fleetwood Town 3. Second Half ends, AFC Wimbledon 0, Fleetwood Town 3. Substitution, Fleetwood Town. Nathan Sheron replaces Wes Burns. Foul by Tommy Wood (AFC Wimbledon). Substitution, AFC Wimbledon. Tommy Wood replaces Joe Pigott. Goal! AFC Wimbledon 0, Fleetwood Town 3. Ashley Hunter (Fleetwood Town) header from very close range to the high centre of the goal following a corner. Attempt saved. Ched Evans (Fleetwood Town) header from very close range is saved in the top centre of the goal. Corner, Fleetwood Town. Conceded by Adedeji Oshilaja. Harrison Biggins (Fleetwood Town) wins a free kick on the right wing. Substitution, Fleetwood Town. Harrison Biggins replaces Jason Holt. Tennai Watson (AFC Wimbledon) wins a free kick in the defensive half. Corner, AFC Wimbledon. Conceded by James Husband. Corner, AFC Wimbledon. Conceded by Wes Burns. Attempt saved. Paddy Madden (Fleetwood Town) right footed shot from the left side of the box is saved in the centre of the goal. Corner, AFC Wimbledon. Conceded by Ashley Eastham. Attempt blocked. Will Nightingale (AFC Wimbledon) right footed shot from outside the box is blocked. Corner, Fleetwood Town. Conceded by Terell Thomas. Mitchell Pinnock (AFC Wimbledon) is shown the yellow card for a bad foul. Substitution, AFC Wimbledon. Anthony Wordsworth replaces Andy Barcham. Substitution, AFC Wimbledon. Dylan Connolly replaces Jake Jervis. Ched Evans (Fleetwood Town) wins a free kick on the right wing. Corner, Fleetwood Town. Conceded by Aaron Ramsdale. Attempt saved. Wes Burns (Fleetwood Town) right footed shot from the centre of the box is saved in the top centre of the goal.